Here’s a transaction example that I worked with. I have a hypothetical invoice for $10,000. The invoice has gone unpaid for over a year. A payment arrangement has been worked out with the client where for every $90 they pay, $100 will be applied to the invoice (instead of giving them a $1,000 credit up front). What this means is for each payment of $90, there is actually a $100 reduction in A/R, which means applying a payment and adding in a $10 write-off at the time of apply. Here’s what the inquiry window looks like for this (I didn’t get a screenshot of the actual apply window unfortunately). “The problem” isn’t actually a problem, but it sure does look weird. Here is what the RM HATB looks like when you have a write-off during an apply. The payment amount on the PMT lines is the $90 representing the amount of actual cash received, but where is the write-off? 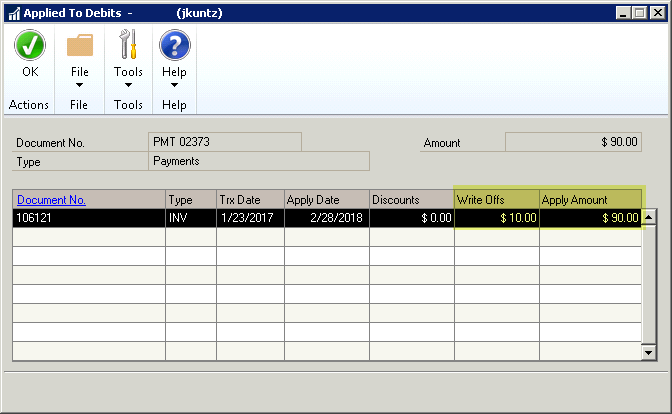 In my example, I’ve recorded 2 payments of $90, and the invoice balance is $9,800. The Grand Total is correct, it shows $9,800 but what isn’t super obvious is the heading on the Over 90 column shows the invoice amount is actually $9,980, not $10,000. That’s where the write-off amounts accumulate so you don’t see the detail of $10 per payment like you might expect. So, in the end the report is actually correct, but what you’re not seeing is date by date detail on the write-off amounts. The detail would be completely visible in something like Smartlist if you need to see it by date though. That’s it for this post. It’s something that came up at work, when one of our A/R team was concerned that the report was wrong, not showing the correct amounts. I figured she might not have been the only one who ran into this!